Until very recently, Safari, Apple’s Web browser, has for me always come in a distant second to Firefox. But with the latest update to Safari, that may change. 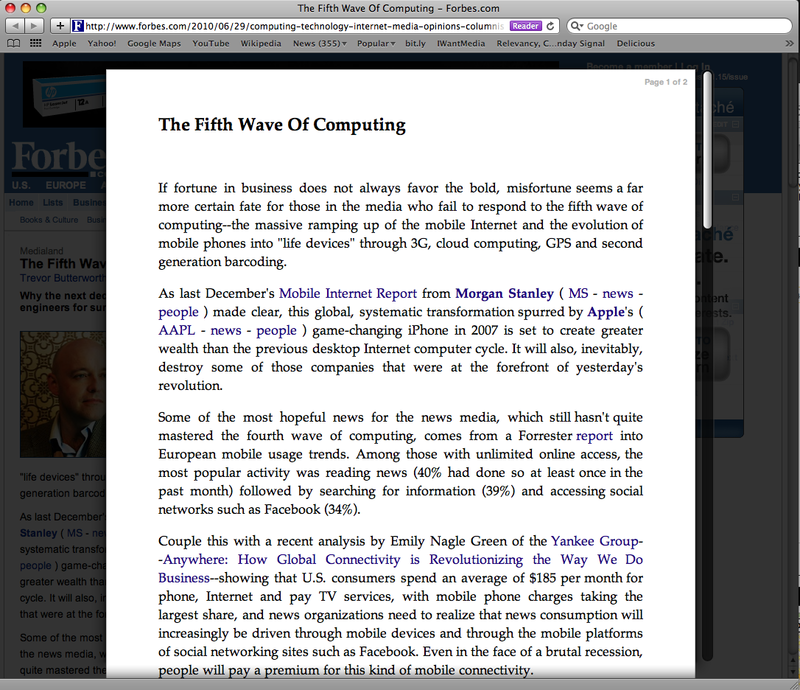 A new feature in Safari 5.0, Reader, is a compelling tool for reducing an article on the Web to its essence: the words. That such a tool is necessary underscores just how unfriendly to readers most Web sites have become. 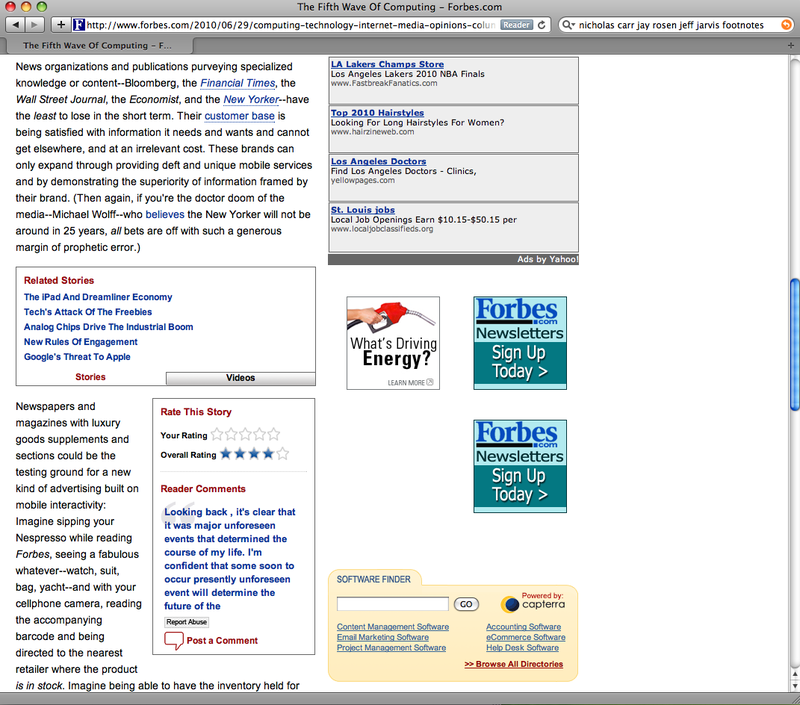 Why is it that online publications make it so hard to read the articles that are their main reason for existence? But as sites start to accrete banner and text ads, e-book downloads, affiliation badges, boxes highlighting related and popular articles, and far too much more, the story gets increasingly hard to find, and difficult to read when you do find it. 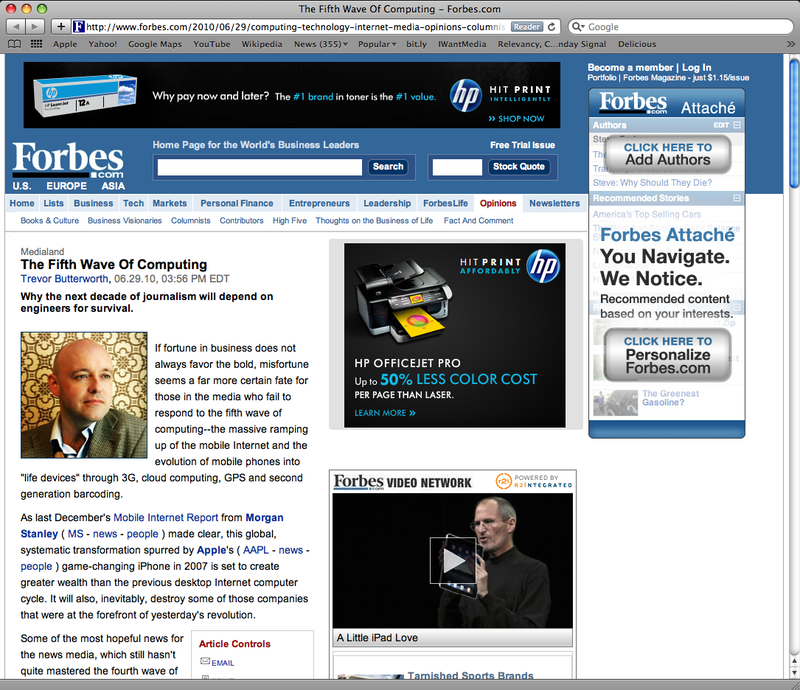 Take, for example, a recent article on Forbes.com, “The Fifth Wave of Computing” by Trevor Butterworth. If you set out to make an article unreadable, you couldn’t do much better than this. It doesn’t get better as you go further down the page, either (especially considering that when you get to the bottom, you have to click a “next” link to read the remainder of the story). To our rescue comes Safari’s Reader. Instead of heaps of distracting clutter, we get nothing but the essential article content, and all in one page—no page jumps to deal with. Safari’s Reader is not perfect. It may leave off by-lines or author photos, as in the above example, or struggle to place images correctly. That’s one reason why, if you value your Web content and hope for meaningful engagement with site visitors, it’s in your interest to reduce clutter to a minimum. Your goal should be to design your site for real readers, not Safari’s. Nerd-note: Safari’s Reader has its roots in a browser bookmarklet called Readability, which works in almost all browsers. 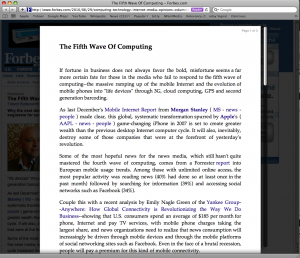 Though it produces equally readable text, it doesn’t integrate into the browsing experience as smoothly as Reader. 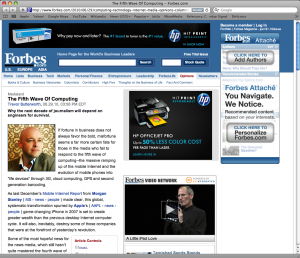 In addition, it seems not to load all the pages in a multipage article, as Reader does. This entry was posted in Design and tagged content, design, links by John Bethune. Bookmark the permalink.